Budgeting typically translates to multiple employees coming together with historical figures and research-driven projections for the upcoming year’s financial strategy. Globally, Excel is still the finance world’s favorite program, but with manual processes of linking spreadsheets, it isn’t secure or efficient. A large number of organizations still depend on Excel, so investing in an ISV tool might be perceived as an avoidable cost. But let’s discuss the benefits you can reap with today’s best features and functionality in budgeting solutions for NFPs using Dynamics GP. ISV budgeting tools have only become more popular over the years with more easy-to-use, flexible, and collaborative functionality. Excel add-ins are prevalent, adding to the familiarity of the spreadsheet application with dynamic functionality from a toolbar ribbon, enabling end users to move away from manually linking separate worksheets together. The best ISV tools offer built-in automation and accounting logic for easy business end user data management in addition to reusable templates. Budgeting for any industry involves concerns of logistics and security, especially as the amount of data, confidential or not, is steadily growing. Today’s features, like access rights and password protection, are transforming collaboration into true ownership over the budgets everyone on the team has to work with throughout the year. With modern solutions, you can eliminate back-and-forth e-mail conversations with heavy spreadsheet attachments. Budget managers can then make sure budgeting collaboratively is easy and inclusive. Additionally, you can measure your potential return on investment in more than just money. When you weigh all of your time and energy, in addition to the dollars your NFP spends on budgeting, today’s planning solutions can be a valuable investment. What should you be shopping around for then, in terms of the top features and functions? Elements to consider: Excel versus proprietary interface, budgeting capabilities, integration methods, a comprehensive BI suite or a stand-alone software, and Cloud or web-based software options. So, we all know that Excel has been king around the globe for a couple decades, but let’s zoom in on why it is still is today: the familiarity with the program makes it easy to use. An Excel add-in streamlines and accelerates the program. Moreover, an add-in upgrades Excel in terms of functionality, with additional budgeting abilities, reusable templates, and secure collaboration. That all said, proprietary and web-based platforms are also popular. Some ISVs argue that Excel is a tedious mess, whether an add-in or not, particularly for budgeting, but this statement is usually associated with marketing their own proprietary platform solution, both on-premises or web-based. Since these tools are not Excel-powered, designing your budget might be more challenging to learn because your team will have to master non-Excel rules and formulas. This could mean more substantial training and consulting money, which is just one cost to consider. No technology is going to solve every person or organization’s problems, but you should rule out software that isn’t an actual solution for your planning goals. The best of today’s budgeting tools should empower you to compare your historical actuals with projections side-by-side for the coming period, simply add multiple line items for accounts, distribute totals across a year, craft reusable templates, view authorship, perform roll-ups, and employ parameters like Department, Division, and Entity. Additionally, what-if analyses can be helpful for your team to see how different scenarios can have an effect on your outcome. For example, when planning for new personnel, you might want to look beyond the GL to break down your on-boarding, training, and payroll costs, with statistical reporting and headcount calculations. And these kind of tasks should be easy-to-use for management at all levels. This blog has previously covered the differences between online analytical processing (OLAP) cube and data warehouse integrations, comparing which elements might better serve different organizations to achieve your particular objectives regarding live integrations versus relying on a BI data store, but business user friendliness should be your top priority. Do you have personnel that possesses the necessary OLAP-specific experience and skills to manage the cube? Do you have multiple data sources to manage and include in analytics? Do you plan on upgrading other BI processes? Some ISVs offer comprehensive suites of fully integrated BI tools. If your long term plan involves upgrading financial reporting, data visualizing, or simply storing your data, you should look at a BI suite. Instead of working with several disparate software, you can depend on one team of sales, consulting, and support professionals. Fully integrated suites provide similar interfaces, which translates to a shorter learning curve for users. Additionally, budgeting is following the trend of online platforms as a solution. 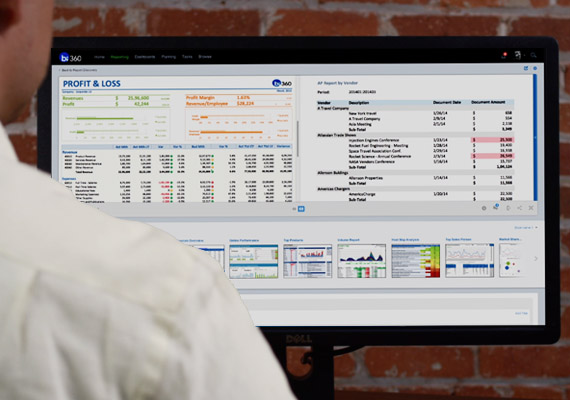 Web-based BI solutions are the present and future, and budgeting has made the move. You probably know that the accessibility and flexibility a web-based solution offers to data management and analytics is what makes it valuable. That said, don’t just default to the first web-based budgeting solution you encounter. You have to ensure that the tool meets your specific needs. Web budgeting is only going to become more prevalent, so you’ll hear more and more about it. Finally, NFPs should consider how a budgeting tool can generally and specifically assist their organization to plan for all of the donors, expenses, fundraising, payroll, special events, volunteers, and so forth – that all contributes to the overall financial health. As a NFP, it is arguably even more vital to combine all of your data to plan precisely for a successful future. Solver produces an Excel-powered budgeting stand-alone tool, with web budgeting front-end options, and it is also part of the comprehensive suite of BI solutions and would be happy to answer questions and generally review BI360’s easy-to-use Planning solution for collaborative, streamlined decision-making capabilities with Microsoft Dynamics GP for not-for-profit organizations. This entry was posted in BI360, BI360 Planning, Business Intelligence, Collaboration, Excel 2010, GPUG, InfoManager (BI360 budgeting module), Microsoft Dynamics, Solver Operational Data Store (BI360 Data Warehouse module) and tagged Adaptive Insight, anaplan, BI360, biznet, budgeting, capex budget, donors, excel, forecasting, fundraising, General Ledger, GPUG, grants, Host Analytics, Microsoft Dynamics GP, modelling, non-profit, not-for-profit, organization, payroll budget, planning, project budget, prophix, revenue budget, Sub-ledger, Tidemark, volunteers, web budgeting, what-if scenarios by Matthew Felzke. Bookmark the permalink.